During the past decades independent regulatory agencies (IRAs) have become ubiquitous in policy areas from telecommunication and transport to financial markets, health care, education and food safety. IRAs are now the standard institutional framework for policy-making in these and many other policy fields. One of the alleged benefits of IRAs is that they are placed outside the traditional state bureaucracy and their day-to-day operation is therefore less prone to interference from political office-holders. However, in my recent research I show that the creation and operation of IRAs are very much shaped by political pressures. Yet I also demonstrate that higher levels of formal independence can make interference from elected officials less likely. First, ideologically extreme governments are more likely to establish IRAs than centrist ones. The graph below shows how the probability of an agency being created increases over time (since agencies are at some point created in almost all of the policy domains and countries observed). 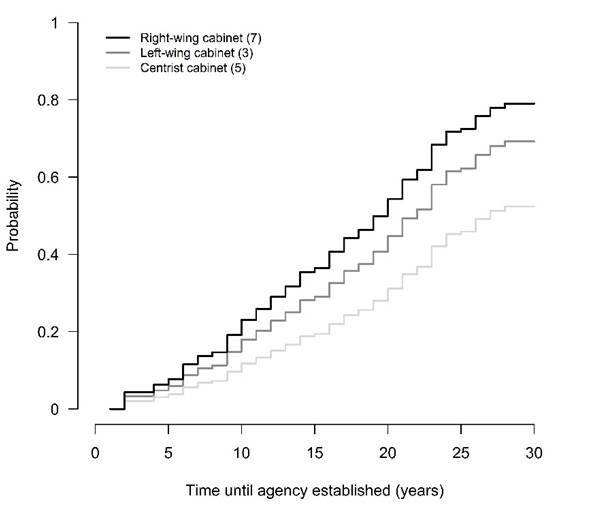 Importantly, the black line (right-wing cabinets) and the dark grey line (left-wing cabinets) go up faster than the light grey line (centrist cabinets). One plausible interpretation of this result is that more extreme governments have more to lose when they are replaced, because it is likely that an alternative government will have quite different preferences. Extreme governments therefore have more incentives to institutionally protect their policy decisions by establishing an IRA. Second, it turns out that right-wing governments are more likely to create IRAs in economic than in social domains. 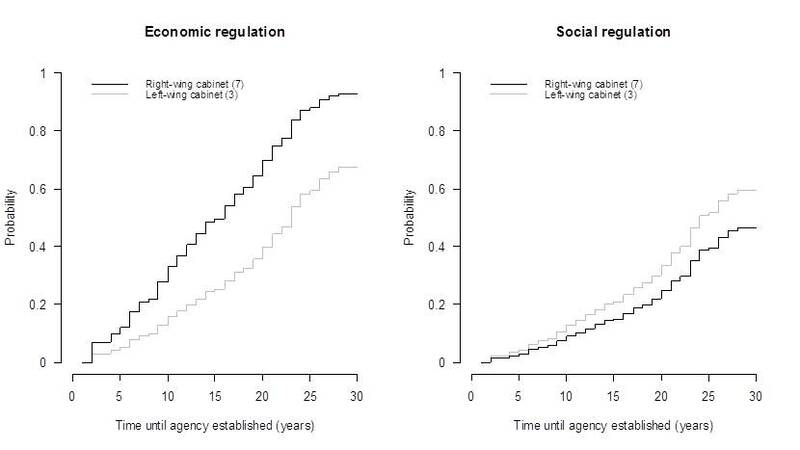 As the figure below shows, under right-wing governments (black line) the probability of an economic regulator being created increases much faster over time than that of a social regulator being established. For left-wing cabinets (grey line) the two probabilities are quite similar. One possible explanation for this finding is that the usual policy tasks of economic regulators (promoting competition, ensuring the functioning of markets) are of higher priority for right-wing parties than the typical duties of social regulators (environmental protection, consumer protection, product safety). The second paper is forthcoming in Comparative Political Studies (ungated here) and looks at the influence political parties have on the careers of agency CEOs – one of the most important channels of influence, especially when agencies are not bound directly by the instructions of government ministers. More specifically, the paper examines whether the party affiliation of agency CEOs and the formal independence of an agency have an impact on the CEOs’ survival in office. The careers of about 300 agency CEOs in 16 West European countries are examined for the period from 2000 to 2013. Information on party affiliation was coded from the CVs of agency CEOs. Formal independence is measured through an index developed by Fabrizio Gilardi (see his 2008 book ‘Delegation in the regulatory state: independent regulatory agencies in Western Europe’) and takes into account appointment and removal procedures of the agency management, term lengths and term limits, and whether terms are renewable. The baseline expectation is that CEOs with a party affiliation survive longer as long as their party is in government, but are more vulnerable when their party is in opposition. A first glance at the data seems to confirm this assumption. 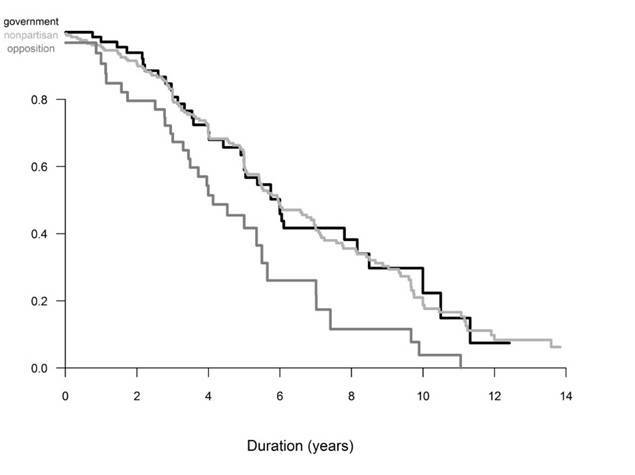 In the figure below, the probability of surviving is depicted as a function of time. Opposition-affiliated CEOs (dark grey line) have a consistently lower probability of staying in office compared with their government-affiliated (black) and nonpartisan (light grey) colleagues. Interestingly, however, further analysis shows that this ‘opposition penalty’ varies considerably with the formal independence of an agency. In highly independent agencies there is no difference in how long opposition-affiliated and other CEOs stay in office. By contrast, the opposition penalty is substantial in agencies with low levels of formal independence. These results demonstrate how party politics and institutional factors interact in shaping regulatory politics in Western Europe. Even though many agencies enjoy some formal protection from direct political interference, IRAs are – as all public institutions – political creations that operate in a highly political environment. 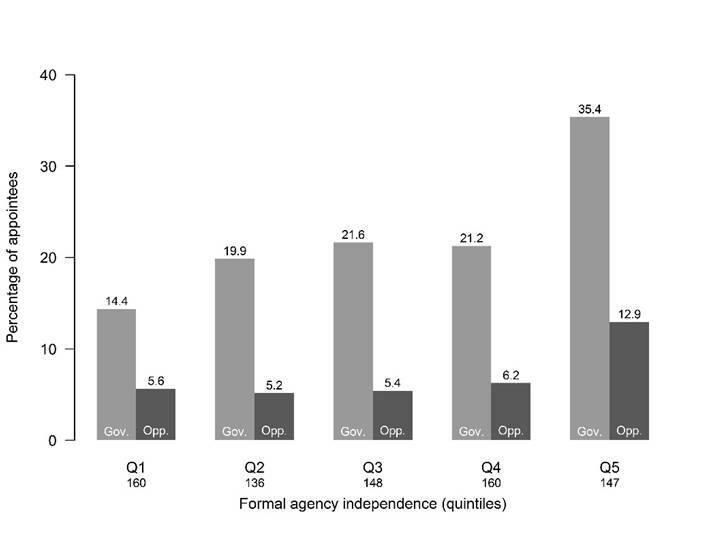 As we move from the agencies with the lowest level of independence (Q1) to those with the highest (Q5), the share of government-affiliated appointees (light grey bars) rises from 14 to 35 percent. A smaller increase happens for opposition-affiliated appointees (dark grey bars): from 6 to 13 percent. As these figures make clear, politicians respond strategically to the loss of formal control brought about by the rise of IRAs. While a high level of formal independence thus awards an agency some protection against political interference, it also invites politicization of appointments made to the agency management. Taken together, this research shows that regulatory agencies are fundamentally political organizations whose creation and operation does not happen in a neutral environment where efficiency and expertise are the only relevant parameters. Even though political influence may often be subtle and indirect, it would be naïve for researchers and practitioners of regulatory policy to disregard it.